An award-winning artist, he began his career as an architect in Sarajevo, Bosnia and Herzegovina, where he worked in that profession for eleven years. His artistic leanings meant he often presented his clients with paintings he did of city motifs to celebrate their new homes. In 1992, civil war broke out in Bosnia and Shex, who was born to seek balance and harmony and to construct, left for Italy. In Italy his life took a dramatic turn, and he began to fully engage in an artistic career as well as studying the discipline. In Rome at a mass for artists in Santa Maria di Montesanto church on Piazza del Popolo, he met a community of artists who introduced him to art studies and the sfumato technique which later became his signature style. Fortune played a role again in 1996 in Montreal when he participated in a group art exhibition and was unable to return to Italy due to passport difficulties. Although he successfully completed a degree in computer architectural design, Shex made his living by painting Old Montreal city scenes. He also worked on perfecting his sfumato style. Artist talent is sine qua non, but fortune also has to smile on you and lead you to people who recognize your talent. An architect from Pennsylvania, John Franklin, recognized the uniqueness of Shex’s sfumato style and organized an art show for him in the US. Encouraged by the success of the exhibition Shex turned to art full time. In Montreal, Shex was inspired by Jean-Paul Riopelle’s abstract paintings and was stirred to add more colours and more energy to his own canvases. Working simultaneously in sfumato and abstract styles gives Shex a sense of balance. One style is emotional and gentle while the other style is physical and dynamic. Shex moved to Toronto in 2000, and redesigned a small bungalow into a 3500 square-foot house and studio. This stunning conversion gives him a vast and spacious area to both create his evocative oil paintings and display his large works. Many mornings he is up before dawn painting in his singular styles. 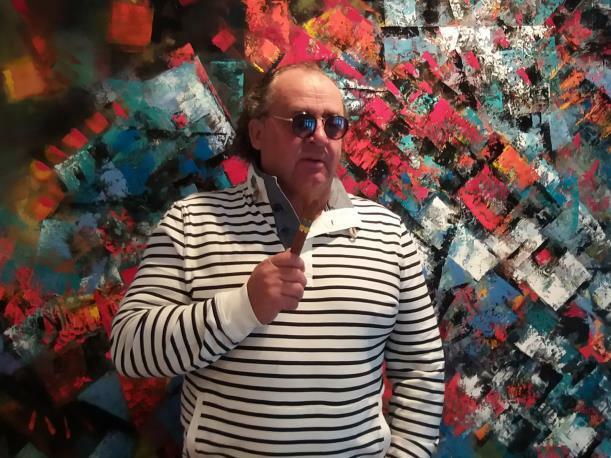 In 2015, Dragan Sekaric Shex won the Award as Best Artist at the Art Expo New York. He has been showing his art at the major art events such as The Artist Project in Toronto, Art Expo New York, Spectrum Miami, and The World of Art in Las Vegas. He has also had solo exhibitions in Toronto, Havana, Belgrade, and Rome.